Nonprofit news orgs aren’t all ProPublicas; many are driven by political interests and aren’t transparent about their funding, a Pew analysis finds. By Joshua Benton @jbenton July 18, 2011, 9 a.m.
Pew’s Project for Excellence in Journalism is out with a new study this morning that looks at the new universe of nonprofit journalism — and tries to get beyond the ProPublicas of the world to see who else is producing journalism under the legal structure of a 501(c)3 exemption. After all, remember, “nonprofit” signals a tax status, not a belief system or a commitment to any particular ideals, journalistic or otherwise. The study found more than a little ideology lurking under that IRS umbrella. Of the 46 sites examined — 39 nonprofit and 7 commercial as a control — around half “produced news coverage that was clearly ideological in nature,” the researchers report. Pew had the expected nice things to say about the usual nonprofit rock stars, like ProPublica, the Texas Tribune, MinnPost, and California Watch. They’re transparent about their funding sources, which are numerous; their doesn’t skew too far in one political direction; they produce a lot of journalism, compared to their nonprofit peers. But the major national networks of state politics sites — the conservative Watchdog.org sites and the liberal American Independent News Network — don’t reveal much about who’s paying their bills, and their work skews clearly in one direction, both in the topics they cover and the content of individual stories. PEJ does a great job, with this and other studies, of moving past barroom debates and gathering real-world data on the new worlds of journalism. And while this research doesn’t draw explicit moral conclusions, it won’t be hard for others to: These nonprofits aren’t all they’re cracked up to be. They’re not objective; they’re hidden tools of politicos; they’re no replacement for newspapers. Beyond the flagships like ProPublica and Texas Tribune, it’s a mucky world. And there’s some truth in that! But two points: First, few of even the most ambitious nonprofit outlets consider themselves true replacements for newspapers. The scale just isn’t there; as Pew’s study notes, the median editorial-staff size at the nonprofits they studied was three. (Although those three people are usually more topic-focused than their print peers — a nonprofit site covering a statehouse might be the biggest player in town with three reporters.) Replacement is a straw man; the vast majority of nonprofits, ideological or not, view themselves more as supplements. Second, a little ideology isn’t such a bad thing. Take the right-of-center Watchdog.org sites, which we wrote about last year. They say their mission is to “promote social welfare and civil betterment by undertaking programs that promote journalism and the education of the public about corruption, incompetence, fraud, or taxpayer abuse by elected officials at all levels of government.” They investigate Democrats a lot more than Republicans, and they’re no great fans of what they see as wasteful big government. The left-of-center American Independent News Network sites works the other side, saying its reporting “emphasizes the positive role of democratically elected government in securing the common good and social welfare, and the continuing benefits of our founding culture of egalitarian government by the people, for the people.” They take on the GOP more than Democrats, and they write a lot about the environment and labor issues. Viewed as replacements, they fall short of what we’d expect from a good newspaper. But as supplements, I’m happy that both exist — that in a state with both a Watchdog site and an Independent site, both sides of the aisle will be poked and prodded, and that stories will surface that otherwise wouldn’t. I’d draw a distinction between ideological outlets as drivers of political culture — Fox News being a prime example — and as drivers of new information. The biggest risk posed by the loss of reporting manpower in places like our nation’s statehouses is that real stories will go unreported. Adding ideological outlets to the mix reduces that chance; at least someone will be paying attention to environmental issues or fraud at the DMV. And, unlike with Fox News, the readers of many of these sites tend to be high-information consumers of political news; a statehouse-news-only site isn’t ever going to reach the broader general audience of a newspaper or TV station. Anyway, that’s just one take on what is a data-rich analysis, a snapshot of an important group of new players in the news world. Go read the full paper. POSTED July 18, 2011, 9 a.m.
Benton, Joshua. "Pew: Nonprofit journalism doesn’t mean ideology-free." Nieman Journalism Lab. Nieman Foundation for Journalism at Harvard, 18 Jul. 2011. Web. 20 Apr. 2019. Benton, Joshua. 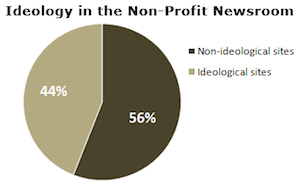 "Pew: Nonprofit journalism doesn’t mean ideology-free." Nieman Journalism Lab. Last modified July 18, 2011. Accessed April 20, 2019. https://www.niemanlab.org/2011/07/pew-nonprofit-journalism-doesnt-mean-ideology-free/.